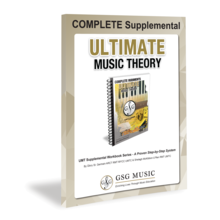 Complete Music Theory Workbook includes UMT Guide & Chart, 12 Step-by-Step Lessons, Plus 12 Review Tests to Dramatically Increase Retention! 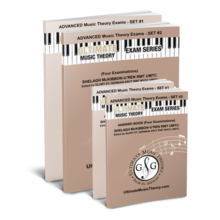 The Complete Music Theory Workbook includes all concepts from Basic, Intermediate and Advanced Music Theory levels and prepares students for college and theory exams. The Complete Music Theory Workbook is an impressive coil bound (256 pages), 9 X 12 workbook with 12 Lessons, Review Tests, Guide & Chart plus 80 Downloadable Flashcards. 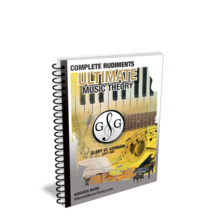 The Complete Music Theory Workbook features these concepts and more!